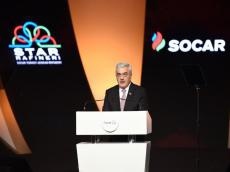 Star refinery will make significant contribution to the development of the economies of Azerbaijan and Turkey, President of Azerbaijan’s state oil company SOCAR Rovnag Abdullayev said Oct. 19 at the refinery’s opening ceremony in Izmir, SOCAR said in a message. An inauguration ceremony of the Star refinery of Azerbaijan’s state oil company SOCAR took place in the city of Izmir, Turkey on Oct. 19. The share distribution in the project is as follows: 60 percent of shares are owned by the Rafineri Holding (being in 100-percent possession of SOCAR Turkey Energy), which previously bought 18.5 percent of the participation interest of Turcas Petrol in the project, and 40 percent of shares are owned by SOCAR.